Benchmarking the energy performance of your buildings is a key first step to understanding and reducing energy consumption and your carbon footprint. 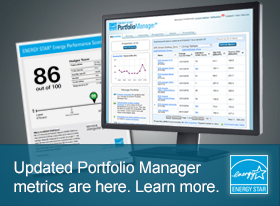 All buildings can assess their energy performance, water efficiency, and carbon emissions using Portfolio Manager. Once you’ve identified and collected the necessary data, benchmarking is relatively simple. It requires only a few minutes a month and provides many valuable results. And the “add property” and “add meters” wizards in Portfolio Manager will help you quickly and accurately set up your property in the tool. The following resources will help a first-timer get started with benchmarking. After reviewing these resources, try benchmarking a single building to better understand the value of measuring your performance. Print the Portfolio Manager quick start guide for a handy, at-a-glance guide to the basic steps of using Portfolio Manager. Use the data collection worksheet to find out what data you’ll need to collect to benchmark your property in Portfolio Manager. Visit the training section for Portfolio Manager how-to guides, short videos, and live and recorded training sessions.